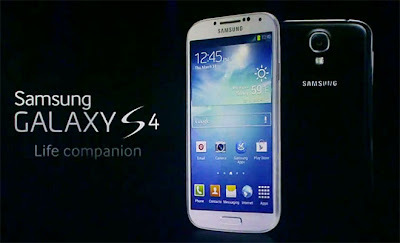 ilulz Blog: Samsung Galaxy S4, what do you think ? I was waiting for March 14 anxiously just to see what Samsung is featuring this time, I even marked my calendar at work, home and my phone just to make sure I wont miss the event! But I did miss it eventually :/ As I said before, if it was an Apple product, I would've been the first in line just to know what's going on. However, I have been googling around to check out Galaxy S4 features and reviews for those who actually have seen it. And here is what I have found. The design is pretty disappointing because it's similar to Galaxy S3, no difference at all except that it's slightly taller, slimmer, lighter in weight and the 5-inch display fits the design properly. Galaxy S4 will be available in two colors: black mist and white frost, and is made entirely of polycarbonate. Unlike what was expected from the video teaser [Part 2]! Maybe they will launch different colors later. - The 5-inch screen is a full HD 1080p display. It is said that the screen would give you a great experience when looking at images, videos and when playing games. - It comes with 2 GB of RAM. - 1.9 GHz quad-core processor or 1.6 GHz octa-core (eight core) processor. Samsung representatives said that different markets will get different processors. - An IR-blaster built in which allows you to change your TV channels right from your phone. - 13 megapixel rear-facing camera, and 2 megapixel forward-facing camera. All in all, the phone has 12 different shooting mood. One impressive feature is the DualShot, which allows you to take a photo with both the front and the rear camera at the same time and then combine the two together in one single photo. - Android OS, v 4.2.2 (Jelly Bean). - Storage: 16/32/64 GB with a microSD up to 64 GB. - Smart Pause feature, which allows you to control the screen with your eyes. If you were watching a video and you moved your eyes away the video will stop, until you direct your eyes again to the screen. - Group Play feature, enables you to share music, photos and games with people around you. - Air View feature lets you hover your fingers over an email, S Planner, or image gallery to view a larger preview of content before selecting it. It also allows you to change a song, scroll through a web page, or answer a call by just waving your hand. - A FitBit feature that will keep a track of your health, sleep patterns and all. - S Translate feature helps you to translate your text-to-speech and speech-to-text into 9 different languages. The device will be launched in April end, but it's not said which day, or country. So I assume that the device will be available in Kuwait probably in May or June. Honestly, I am not very impressed with the Galaxy S4 and will not buy it or want to have it, unless if it was gifted to me "My Birthday is this Sunday btw lol :-p"
Do I have a problem with Samsung? No, but I don't like their theme and OS, it's really annoying and not very creative. But they have great features that I would want to have in my phone. And maybe, and I say MAYBE after I see or use Galaxy S4 I might change my mind, who knows! "I like Galaxy note 2, so don't get me wrong"
Yet again, I hope the next iPhone is going to be much better :-D And yes I am an apple fan. I'm disappointed that it looks like the S3 but it still easily puts the iPhone 5 to shame.. (specs-wise at least). I was unimpressed with the S3 when it launched, but when I got a hands-on experience I liked it much more. Samsung are terrible at marketing their products so most of us get a first bad impression. Who knows, maybe they purposely do that so that everyone would want to try it and see if they will change their minds. You are totally right, I have written earlier about Samsung and their marketing strategy when they were launching S3. It's very disappointing! This time they were trying to do something different with the video teasers and so, but it didn't work out well with them. I have tried Samsung S3, but I didn't like it as much as I liked iPhone 5. But to be honest, I really like the features it has. Once again, you are right maybe after we try the device we will see the difference or know if it's worth being purchased or not!